Today more than ever, we are constantly connected and reachable. It has never been so easy to communicate with people around the globe. We can also observe new kinds of social relationships due to technology. In fact, connections between strangers can nowadays easily be made through the use of applications and devices. Nevertheless, connections between people and more specifically users should not be taken for granted. Lievrouw suggests in Alternative and activist new media that: “Mediation comprises an on-going, mutually shaping relationship between people’s use of communication technology (reconfiguration) and their communicative action (remediation) that produces social and technological change” (Lievrouw 231). In short, if change is conceivable, it is possible to challenge dominant and accepted social behaviours through the new technological tools of communication. This change will here be demonstrated through the connections between users of donation-platforms and projects. Share A Dream is a perfect model of emergence in “New Media” in terms of practice because it rethinks connections between people. The Swiss start up that has launched last year, wants to make projects and local NGOs (nongovernmental organisations) around the world more visible and reliable. Share a Dream’s founders came to realise that there was not a lack of associations or people keen to contribute but a lack of information and communication about the projects themselves. It is undeniable that people seek information mainly on the Internet and that a lot of NGOs, associations or projects don’t have the funds or capacities to create a website or maintain a page. One can say that platforms of donation are numerous and that it is even possible to donate through Facebook nowadays (see picture 1), but “none of them discover the projects in the way that Share A Dream does. They uncover projects, and produce themselves videos for them to make the NGO’s visible on the web” tells us Niklas Van Neyghem the founder and CEO of Share a dream (Skype interview). What makes this start up essentially different from other humanitarian platforms is the specialization on less known but reliable projects with a real purpose thanks to field and in-depth experiences. Moreover, this “selection” facilitates the matching process between users and unknown NGOs to connect and therefore to delete the lack of information and communication previously mentioned. However, to observe a social change in communities through contribution it is necessary to strive for long-term actions. But people who participate want to know how the project is carrying on and in which ways their money or expertise was helpful as soon as they take part of it. As we want actions to be visible and we live in a constantly more instantaneous society this paradox can nevertheless be partly solved. 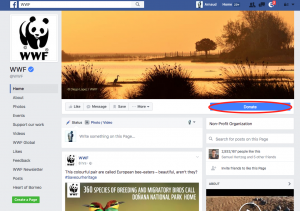 Using modern communication tools such as video and social media – Facebook, Instagram or YouTube – Share A Dream uses “follow up” techniques for each NGO keeping the users informed and updated. In fact asking the NGOs to regularly send updates to Share A Dream not only confirms if the project is reliable but also allows the user to be part of the project evolution and have a quasi-immediate feedback. In addition to follow ups, the recourse to video portraits/reports of professional quality requiring presence as close as possible to the field, permits that the message transmitted – through the social medias and the website – to potential sponsors and volunteers is both relevant and charged with emotions, as well as a high level of personal trust. The creation of an emotionally-attached and intimate community is very important in the way that the more contributors feel close to the people the more they want to help them. Being able for contributors to see the result is what makes them want to help again becoming an impact addict. To conclude, connections between people thanks to web communication tools is essentially “New Media” in Share A Dream’s project not in a technological way but by suggesting new conceptual methods and action for a collectivity. Lievrouw, Leah A., Alternative and Activist New Media, Maiden, MA: Polity Press, 2011. Wolfson, Todd. “Leah A. Lievrouw, Alternative and Activist New Media.” International journal of communication [Online] (2012). Literature Resource Center. 16 Sept. 2016. Laverie, Debra A. and Mc Donald, Robert E., “Volunteer dedication: Understanding the role of identity importance on participation frequency”, Journal of Macromarketing (2007) vol. 27 no.3 274-288. 13 Sept. 2016. Share A Dream. “Share A Dream // The Project” YouTube. 4 Feb 2016. Hey Arnaud Muller. I really like the link you make between good communication and change. The information nowadays is everywhere and hopefully we’ll make it interesting enough for people to stop by and take action with what they have and what they can see. « Squarespace and Interfacification: How Much Does Knowing How to Code Matter Anymore?